Looking for frugal ideas? Check out our site! I am so bored. I sit and read all day. I’m trying not to leave the house much, due to the heat, that I don’t want to put on sunscreen, and that if I leave the house, I spend money, which I shouldn’t be spending. I tried to contact a local hospital about volunteering again for the summer (I used to volunteer in the NICU, Labor and Delivery, and the Newborn Nursery), but they haven’t called me back. I might try the local children’s hospital. It’s one thing going from teaching to summer, but it’s way different going from grad school + teaching to nothing at all to do but read and exercise during the summer. I don’t want to quilt. I’ve done a little knitting, but I just want to read. I downloaded the required reading list for birth doula and postpartum doula certification. I’m currently reading: The Birth Partner, The Complete Book of Pregnancy and Childbirth, and Homebirth in the Hospital. I don’t think I’ll go through the training and become a doula, as I’m only off work for two months, but I’m learning quite a bit about childbirth and pregnancy. At least I’ll know what goes on if I ever get pregnant. I have decided that I’ll probably deliver at a birthing center and I’ll get a doula. I’m on the lookout for vegan recipes, so that I get a variety of different foods (and thus a variety of vitamins and minerals), to help me eat healthier vegan choices, and so that I don’t eat the same thing every day. I picked the greens book, because I know very little about leafy greens (including identifying them in the produce section) and I want to know how to cook them. I picked the baking book, because I want to make my own bread, vegan style. In an effort to be more frugal and stay within my grocery budget, I’ve taken to making bread at home. We’ve used our bread machine with success many times, but I don’t like having a hole in the bottom of my bread (from the mixing blade in the bread machine). I came across Artisan Bread in Five Minutes a Day at the bookstore and requested it from the library. I’m so happy that I did. First, you mix warm water, yeast, salt, and flour in a container with a lid. You let it sit, covered, on the counter for two hours. Then, you can make some bread. If you don’t want to bake that day, you put the container in the fridge for up to two weeks. You only have to mix. You don’t have to knead the dough. When you’re ready to bake, you sprinkle the dough with flour, cut out a piece, and shape it. Then, you put it on a surface (or in my case, a bread pan, because I wanted a loaf shape instead of a round shape) to rise. If you haven’t refrigerated the dough, you let it rise 40 min. If the dough is cold, you let it rise 1 hr, 40 min. You don’t have to cover it or make sure the temperature is just right for rising. 20 minutes into the rising time, you turn on your oven, with an empty pan with sides in the bottom (I use a round cake pan). This pan will be to hold hot water. If you plan to use a pizza stone, you stick that it to heat up, too. At baking time, after slicing some slits in your bread (I always have trouble remembering to do this), you put your bread in the oven (on the pizza stone or in your loaf pan) and also pour about 1 cup of hot water in the pan at the bottom of the oven. This will produce steam and make the crust of your bread hard. Bake for 30 minutes and you have fantastic bread! 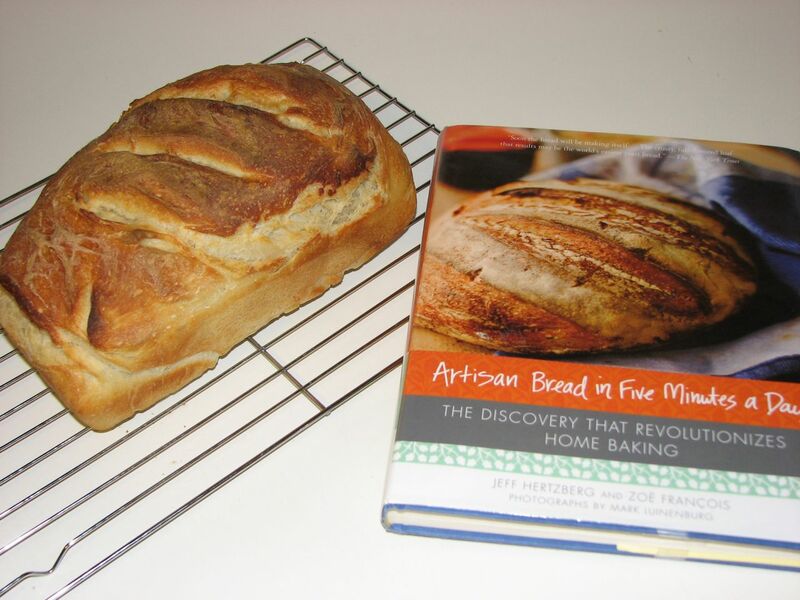 Let’s say that you finish that bread partway through the week and you want to make another loaf… All you have to do is take your bread dough out of the fridge, shape it, let it rise, and then bake it! When you finish the dough in the container, don’t wash it, because the dough gains more of a sourdough flavor over time. Instead, leave the container in the fridge until you’re ready to mix another batch of dough. I tend to mix a batch every weekend or two. If your fridge is large enough to accommodate the container, you can mix double, triple, etc. batches of the dough. 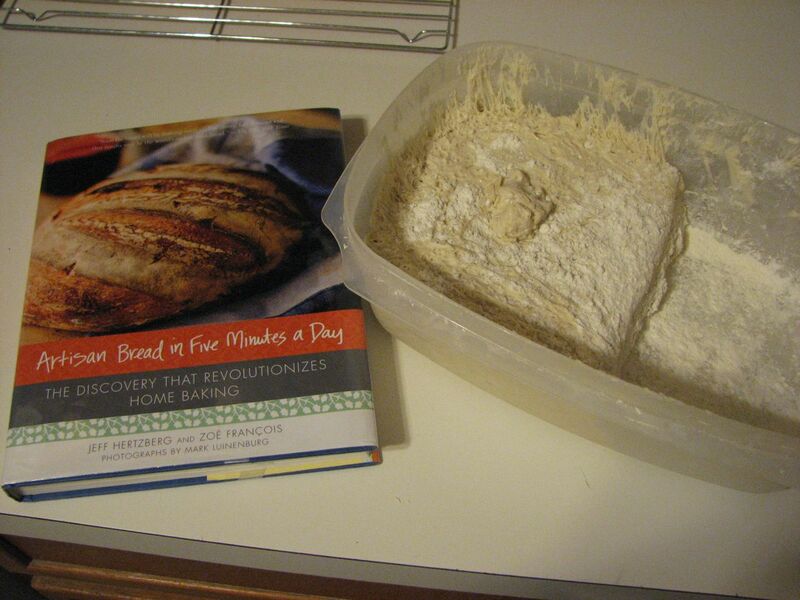 The book also contains additional bread recipes, as well as how to use the dough for pizzas, etc. 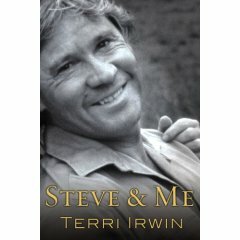 I finished Steve and Me by Terri Irwin this week. It was such a wonderful read that I couldn’t put it down. Within 24 hours (over two days), I had finished the book. This is a memoir of Terri Irwin’s life as the wife of the late Crocodile Hunter, Steve Irwin. The book briefly highlights on a few details from her past, as well as Steve’s, but mostly focuses on how her life changed after she met and fell in love with Steve. It all begins when she first visited Steve’s family’s reptile park, which is now known as the Australia Zoo. I really loved how Terri explained the inner struggles of waiting for that first phone call from Steve after returning to the United States from Australia, new experiences learning to camp in the Australian Bush (On her Honeymoon! ), or the uncomfortableness of learning to be around snakes. Ever sat with a snake on the living room couch? Apparently, both Terri and the snake were learning to be friends. They started out at opposite ends of the couch, but eventually became good enough acquaintances to do housework and appearances at the park together. Terri’s experience with this first snake also prepared her for eventually being able to “tail” or correctly and gently pick up venomous snakes in the wild. Terri also goes on to give various stories or excerpts of her life with Steve, and later with their two children, Bindi and Robert. As you read the book, Terri’s voice reads like you’re listening to a conversation with her. The loving relationship she had with her family really comes through the pages. You feel a connection with Terri and can envision yourself right there, catching crocodiles with the entire family in the bush or experiencing the deep love and respect Terri and Steve had for each other. I would definitely recommend this book, especially if you have been reading a lot of fiction lately, and you want an easy way of getting back into non-fiction. Also, if you’ve ever been a fan of the Crocodile Hunter shows, then this book is for you.